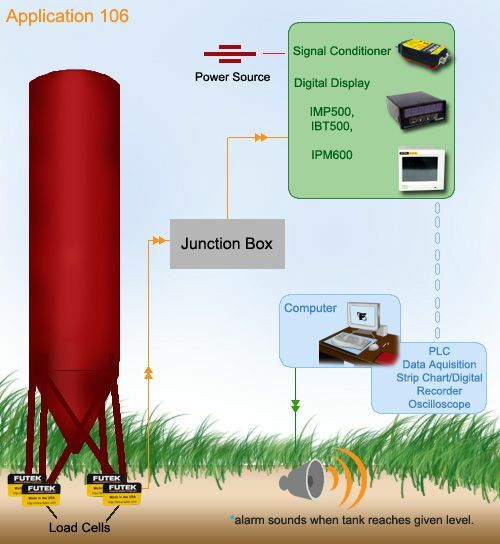 Load cells can be placed on the legs of a silo or tank in order to monitor how full it is. When more than one load cell is used, a junction box is needed to average the load of all the load cells and provide one output which can then be connected to a computer or plc using a signal conditioner or digital display to show the output. The system can be automated so an alarm will sound once the tank reaches a certain level. It can notify someone via email when the tank is full, empty, or at whatever level the system is set at. The application can also be setup to trigger another tank to fill it when it reaches a given point. The way it notifies a user can vary, but the overall application is the same.